In this issue, we look in detail at the proposal for a shared pedestrian and bike cycleway from the Parramatta CBD travelling along the tributaries of the Upper Parramatta river to link a range of outlying areas by off-road routes. It is a crucial route since it links the Parramatta CBD, Sydney's second CBD, to areas where there's little public transport. As such it could eliminate a number of car trips. Road Toll - The Real Problem? The holidays are over and we're left with a shocking road toll. We were surprised that no reason could be found for the toll. We're not experts, but we noticed a strong recurring pattern: cars. We can make some improvements with seat-belts, ABS, and RBT. However, we need to accept that, despite the good efforts of the RTA and police, cars remain a very dangerous way to move. As a society, we need to make a choice. If loosing hundreds of lives every year is worth the 'convenience' of driving our cars everywhere, then let us stop demanding our governments to 'do something'. Otherwise, we suggest we shift to more people-friendly modes of transport, particularly in our cities. We know which CAMWEST prefers but, whatever our choice, please let us stop pretending that we can continue our obsession with the car and not pay a social price. One of the best ways to reduce the toll is to replace car trips with bikes. Australia Cycling states that 35% of car trips are under 5 Km, a distance that takes 10-15 minutes to ride. Let's have a review of our road rules and make the bicycle a 'special vehicle' with appropriate protections and priviliges, as other countries have. Let's also remove bull-bars from cars in cities, when they are not needed and can hurt people. Starting Point: Gough Whitlam Park Tempe, 200m from Tempe railway station. Routes and distances: There are two routes. Route 1: The Cooks River Cycleway, with turn around points at the 4km, 8km and 12km marks, making a choice of three total distances of 8km, 16km and 24km. Route 2: The RTA Route to Kurnell. A total distance of 60 km for more experienced or keen riders. Registration: Participants can register over the phone on 1800 034 034 at any Body Shop, or One World Shop, or on the website at www.caa.org.au. NB: Cyclists register the same way as Walkers in the "walk against want", they will receive the same pamphlet and sponsorship book. For further information please call (02) 8204 3900 or email ellies@sydney.caa.org.au. Rumours have come our way that the RTA is considering the introduction of registration for bicycle use on our roads. CAMWEST is totally opposed to this idea. Bikes are a great alternative to the car at a time when petrol prices are very high. Bikes actually reduce our road costs by replacing more car trips. Car use causes more costs than we think, and certainly more than we pay in petrol taxes. Almost all cyclists already pay car registration and petrol taxes - they shouldn't have to pay more. We call on the RTA to deny these rumours immediately. The Environmental Impact Statement for the Western Orbital has been released (RTA Orbital Page, and EIS download page, or call 1800 505 056). The EIS summary makes a brief mention of cycleways, but is thin on details. The full EIS contains a report on bike and pedestrian access, which is good. CAMWEST will naturally make a thorough representation to ensure that good cycling facilities are included. However, we are concerned that so much money can be spent on roads. If we can build such a mother of a road by 2007, why can't we build Sydney's bike network by 2005? Federal Government can surely help with funds (it is throwing $350M at the Orbital!). Make sure you have your say, as the closing date is 5th March. You can simply copy the text below and email it to mal_cross@rta.nsw.gov.au. (Feel free to edit or add to it!). - A grade separated veloway the whole length of the route, with safe signage. - Graded Separation for cyclists at the 13 intersections along the route. - An off-road cycleway following the route. - Extra exits and entries for cyclists, particularly for sports and employment centres. - No toll should be charged for cyclists. - The supply and price of oil over the next 50 years should be taken into consideration. There have been reports of significant increases in public transport usage. This has been attributed to the good experience at the olympics and high petrol prices. The result: overcrowded car park and ride facilities. State Government would do well to provide better cycling facilities to train stations, particularly the 'hubs': Parramatta, Blacktown, Strathfield. More bike lockers should be installed at these stations, with some on a casual basis. Better cycleways are needed to stations. The Parramatta-Liverpool RailTrail is a good start. Space near train stations is too precious to waste on long term car parking. In the space a single car takes, about 8-10 bikes can be stored. 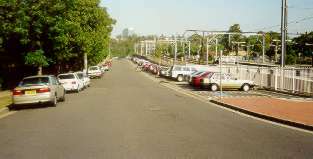 Westmead, for example, is a medium density suburb with a good station. Space at denser areas is particularly valuable, and it shouldn't be wasted on long-term car parks. An off-road 'railtrail' cycleway could follow the rail line on the right of the photo, to Parramatta Park. Bike lockers would also be great for people from the Hills area and North Parramatta. Merrylands Police have started a bicycle police unit, the Parramatta Advertiser has reported (New cycle in crime, 13.12.2000). The use of bicycles by police has proved a great tool against crime: it's cheap, fast, quiet, green, increases police profile in the community, and it works. Let's have more, particularly in medium-density areas. See our previous interview with a velocop from Parramatta. Car free days at Parramatta Park have continued, with the latest ones being on Australia Day and December 31, 2000 - new year's eve! This is a great initiative that we support enthusiastically. A Park with no cars makes for safe family cycling. Let's make it the first Sunday of every month. A new cycle route from Westmead station, as well as good parking policing by Parramatta Council, is needed. The election year has started for federal government, and we would like cycling to be part of the debate. Lately several issues have been on the agenda which cycling can have an impact on: global warming, petrol prices, asthma, child obesity, congestion. Federal Government needs to play an important role of leadership and funding. Email Ross Cameron, MP (Liberal candidate) and David Borger (Labor candidate) and let them know that cycling issues matter to you. Also see under 'Government' on links page for more. OPEC has decided to cut down oil production by 1.5 million barrels per day (or about 5%), and this has already raised petrol prices in Australia. There are possibilities of further cuts in March. We believe the best way to reduce our dependence on foreign oil is to reduce demand. Many short car trips (which waste fuel because of a cold engine) can be replaced by bicycles. More Info. There are fears of an asthma epidemic, the Sydney Morning Herald reported (SMH, 17/1/01). With too many Australian kids suffering from this disease, it makes sense to encourage more cycling. Bikes are good for health as they keep kids active. They can also replace many short car trips, which are common and very polluting. Now that the big party is over, there has been a lot of talk of how to use this site. CAMWEST thinks that cycleways to Olympic Park should be maintained and improved. Cycling to the site adds to the healthy, fun, sporty image of the Park. It makes getting there half the fun. We're pursuing the idea of clubrooms at Homebush Bay for a Sydney Cycle Club, a place where families and cyclists can go to relax, leave their bike safely while attending events in Homebush Bay, get a cool drink and a sandwich, meet friends for lunch, etc (See also OCA's booklet entitled 'Sydney Olympic Park: VISION for Beyond 2000'). Were you there? A number of CAMWESTies enjoyed cycling along Sydney's streets in safety, sorrounded by thousands of other bikes, on last year's Cycle Sydney bike ride from North Sydney to Parramatta Park. The fact that so many people turn up (including older people and children) shows that people want to ride their bikes. Make sure you make it this year. More Info. We've found many people would like to do something about our poor cycling facilities, but don't know where to start. This issue sees the first 'Action Corner', a section in our newsletter where we include one or two suggestions of something simple and concrete that you can do: write an email, letter, representation, turn up for a ride, etc. Good news: it seems many of the problems we raised on the Parramatta-Liverpool RailTrail have been addressed. It just goes to show that we (and you!) can make a difference. This time we're asking you to write a brief representation to the Western Orbital EIS (see section above). Simply copy the text and email it - you're now an advocate! It's time for the big one again, the RTA Big Ride (Oberon to Forbes), on 31 March - Sun 8 April, 2001. This is a great way to get into cycle touring, make friends, and see the beauty of NSW. More Details. We're also planning to hold a ride along the proposed Catchment Cycleway on June 2001 - watch this space! Implement BikePlan 2010 by 2005. Install many more lockers at train stations and provide good cycleway routes there. Make a serious review of Parramatta Council's BikePlan, with clear goals. A grade separated veloway the whole length of the Western Orbital, with safe signage.